While there, students were able to network with various representatives within the Phillies' communications and broadcasting departments, hear from guest speakers such as General Manager Matt Klentak, Marketing Vice President Michael Harris, Broadcaster Tom McCarthy, and Major League Baseball Vice President Billy Bean. The first part of the evening was dedicated to socializing with Phillies representatives, as students from more than 50 colleges and universities were able to walk through the facilities and ask questions about the business, tour the facilities, and learn all that goes into the promotional aspects within the sports industry. Students were encouraged to bring their resumes and collect names and contacts for possible future internships and/or employment. "I thought it was a great experience for all students pursuing a career in communications or in the sports industry," said communications student Jared Watson. "Getting input from executives, marketers, and others really helped me receive information and advice needed for the field. I really believe I got an advantage by attending. Seeing the stadium and talking with these people really gave me the motivation to keep reaching for my goal, a career in broadcasting." Communications student Lauren Moon also enjoyed the event. "The experience was amazing to get to know the many opportunities in the sports industry, whether in front offices or behind the scenes," she said. "One piece of advice that I received was that it's not always about race or gender, but the talent that you have." "We've been heading to this program for a number of years, and each year it keeps getting better," Communications Department Chairperson Rob Rector said. "Students are not only able to speak with professionals in their field of study, but they can see exactly what they need to focus on to become successful in the field after graduation." During the event, students were also able to meet legendary shortstop and senior advisor Larry Bowa, tour the broadcasting booth and the press room, and have their pictures taken with the team mascot The Phillie Phanatic. Top: DTCC communications students Kadija Sow, left, and Edward DeLeon, center, get advice from Phillies Manager of Video Production Sean Rainey during the College Winter Summit at the Wells Fargo Center. 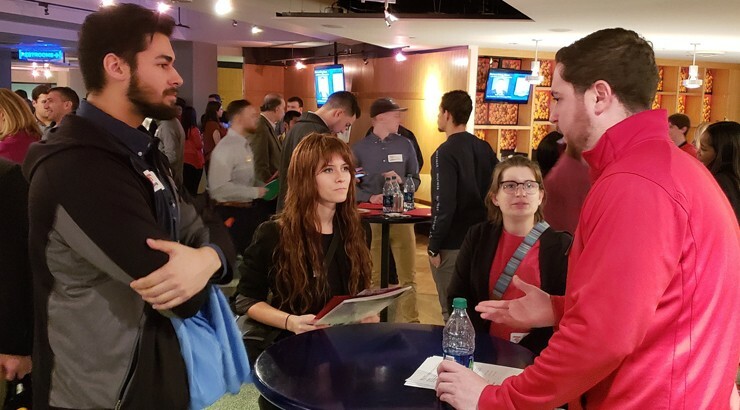 Bottom: DTCC communications students, from left, Chris Parker, Madison Griffin, and Cassidy Clark get career advice from Phillies Social Media Representative Tim Stoeckle during the College Winter Summit at the Wells Fargo Center.